Much like the Bruce Cockburn tune, sometimes it seems we’re all “waiting for a miracle.” Religious or not, we are always on the lookout for that unexplained greatness that our lives could use. 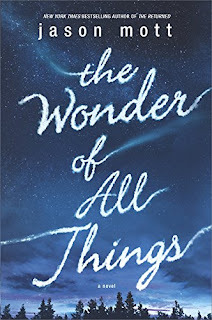 That’s how The Wonder of All Things by Jason Mott is advertised. This book showcases the beauty and the ugliness behind special talents, sometimes coming from the unlikeliest of places. A small town has gathered for the annual air show, with their hometown hero performing acrobatics in the skies above them. In a stunning turn of events, the plane crashes into the crowd. During the ensuing melee, it is discovered that Ava and her friend, Wash have somehow survived the disaster, huddled beneath the wreckage. And her wounded friend is miraculously cured of his injuries. Once Ava’s healing powers are revealed to the public at large, the world descends on their community. Ava suddenly is a reluctant celebrity. Despite the obvious cost to Ava each time she tries to heal someone, people are convinced they are entitled to her powers. She is forced to face the truth of humanity as she struggles to save her family and her friends. And herself. This book is an exploration of the human nature. How deep do friendships go? Can they survive traumatic events, or do they get even stronger? How shallow can people be when it’s the life of one of their loved ones on the line? Ava and Wash and their families must walk among the various landmines set forth by the people seeking the young girl’s powers. Ultimately, this novel delves into the lives of the characters and the struggles they face. Ava struggles with her father’s relationship with his new girlfriend after her mother’s death, as well as her feelings towards Wash and how her powers affect her. Her father wants what’s best for his daughter, especially after losing his wife. He wonders if Ava should be helping all those people who came to be healed by her. Throughout this book, the characters are all very relatable. As a parent, the indecision regarding the sheriff’s daughter was agonizing. Watching her fade away while trying to help people broke his heart, and the reader’s heart. Wash, in his young teenage years, has a devotion to Ava that belies his youth. There is a deep connection between the two, nurtured through a long-lasting friendship. That feeling seems to be mutual. It is what makes a great couple. These characters have that. When the reader actively hopes for the characters to make the right decisions and genuinely come out with the best possible result, you know the author has crafted a fantastic set of characters for his story. This novel shows the good, the bad, and the ugly of what happens to human nature when something miraculous happens. We all want to be a part of it. Sometimes we get overzealous, and the result of that is in fully, dirty detail in this book. I have read Jason Mott’s first book, The Returned. I thought that was also a wonderful book, which was made into a television series, “Resurrection.” In both his books, I loved the development of his character around a single moment that reverberates across the pages. 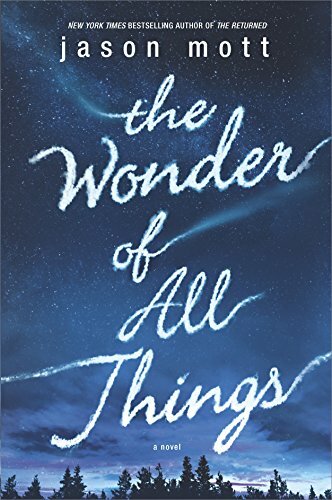 This second book, The Wonder of All Things is just as great as his debut. It will make you think about your own children, or your own family, and what you would do for them. As always, novels with rich, deep characters are my favorite. That makes Mott’s book one of my favorites for the year so far. Craig Bacon wonders about a lot of things. Mostly what’s for dinner, but sometimes how you can get shown the light in the strangest of places if you look at it right.